It’s amazing how winter can be beautiful. The last couple of weekends in Geneva have been an absolute treat… the sun was shining and the temperature was balmy. With an average of 16C, the weekends were warmer than normal and that meant people were out walking, drinking, running, shopping, etc. – any way to get out to soak up the sunshine before the grey and dreary Geneva winter starts. It was as though the weekends were holding back the cold and rainy weather that we have been getting during the weekdays. 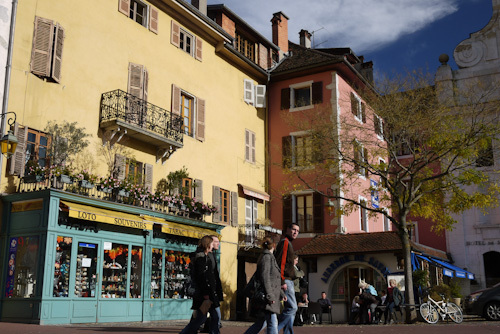 Last weekend was especially excellent and I was happy to join a tour to go and visit the town of Annecy, about an hour train/bus ride south of Geneva into France. Other than the rude waitress at the train station and a small shouting match in French between our eccentric organizer and some locals, the day was a highlight so far in my 2-month stay in Switzerland.